You don’t need a microscope to homeschool biology especially in the elementary school years. Microscopes are only good for viewing life at the cellular level. There is a lot more that can be studied. Here are 52 ways to teach biology. Some involve observing life in your backyard. With other activities you will take your family on field trips. Look through the list to see how you can teach this interesting subject. What animals need – Having pets is a good opportunity for teaching children the needs of animals. All animals need shelter, food, and to feel safe. Growth – Having animals at home is a good way for children to observe the stages of life. Ant Farm - I have never let my children do this. I was always afraid that the container would fall and break. Then ants would escape and live happy ever after in my house. Birds - We have had several different bird feeders. Our first was outside the room that we did school in. Besides watch the birds we also had a squirrel who visited. Now we have a humming bird feeder. We had field guides so that we could learn the names of the different birds that came to visit. Butterfly kit – When I was in science class in college we used a butterfly kit to observe the life cycle of a monarch butterfly. I wish that I could recommend a kit. The ones sold on Amazon have bad reviews. Bee Hive – I don’t remember if this was at a zoo or a county fair but we were able to see a working bee hive. One side was glass. There was also an opening to the outside. We were able to observe the bees coming and going. Pet store – going to a pet store is usually fun for young children. We have looked at fish, snakes, birds, tarantulas, and baby dogs. The staff is usually knowledgeable about the animals that they sell. Arboretum or other gardens – Most of the gardens that we have visited have had identifying markers on the plants. Fish Hatchery – There is a salmon hatchery near where we live. When we went we were able to see the different stages of fish growth. Nature Trail – We have been on many nature trails. Most are easy to walk. There are markers to tell you about what you are seeing. Wild Life Sanctuary – Some have wildlife viewing areas. Zoo – Besides seeing animals most zoos have educational lectures. Aquarium – We were able to learn more about the sea life that lives in the Puget Sound and the ocean. Aviary– The only one we have been too has been at the zoo. Museums – We have been to the Pacific Science Museum. We mainly went to see the dinosaurs’ exhibit. There are also other biology exhibits that you can look at. Another idea is to place a circle of string on the ground. Use a magnifying glass observe living things in the circle. Write what you see in a notebook. Leave the circle on the ground for a period of time such as fifteen minutes to a half hour. Watch and observe life that visits the circle. You might see spiders or ants that pass through. You don’t need many tools to teach biology. We have used a magnifying glass to see items more closely. 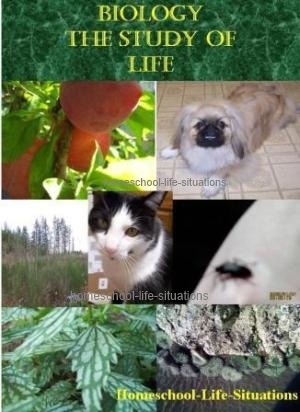 Field guides are good for identifying different living organisms. We have used ones for trees, birds, and wild flowers. I have used tooth picks to help dissect seeds. When my children were young I make a 3D body. There is a virtual microscope online. If you want a more systematic approach to homeschool biology use a textbook. Apologia has books for elementary and high school. They present a creation view point but also talk about evolution. We used Exploring Creation with Biology by Apologia when my daughter was in high school. She did not like doing classifying. Also a lot of the experiments required a microscope. I think that high school biology should be taught in a co-op environment or at a junior college. I feel that students can benefit from using a microscope. Using a microscope is only a small part of homeschool biology.